Have you ever wanted to take your pet for a walk, but they hide behind the couch? Do you want to show your pet the beautiful world outside, but they are scared at what lies beyond their comfort zone? Are your puppies legs too short to go on the long walks you enjoy? Worry no more! 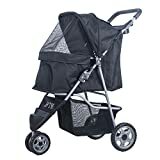 The BTM Pet Stroller gives you the ability to keep your pet in a comfortable environment while finally getting them out of the house and into the great outdoors. This stroller is loaded! It features mesh windows for your pet to look out of while remaining in a calm and safe environment, soft bedding, multiple zippered entry points for you to gain access to your pet, a storage compartment to keep pet supplies and toys, and even a cup holder for the human doing all the pushing! The large wheels are excellent for getting around terrain that isn’t always perfectly flat and level. When not in use, the stroller can be conveniently folded up and stored away until later use. You and your pet will love the added bonding time outdoors with the BTM Pet Stroller, so why delay? Take your little friend for a stroll today!